Every September home gardeners in the Midwest and North find themselves with an abundance of produce at the end of summer harvest season. This generally includes more tomatoes than one family knows what to do with. In addition to harvesting tomatoes all season long, basil can be harvested from spring through fall. The pairing of tomato and basil is so natural that not only do they help each other grow in the garden, but also the flavor combination is perfect on everything from first course to last. I used a Turkish dough known as filo for my garden pastry. I enjoy filo immensely because it is a very fun texture to eat. 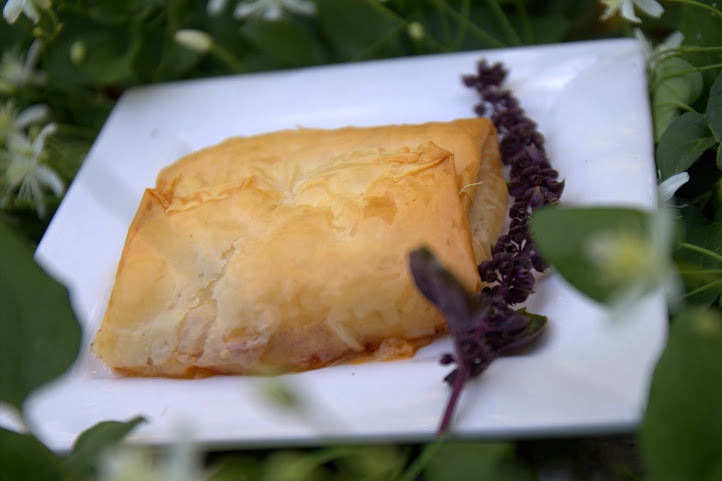 Filo is likely best known for being used in Spanakopita or Baklava, the thin flaky layers create a light and crunchy texture. The reason for filo's unique texture is that the dough is "usually made with flour, water, salt, egg, and sometimes vinegar, though its ingredients show some variation. Preparing this dough depends on the development of gluten from the proteins in flour. Thus the dough is mixed and kneaded until it's pliable and silky. The acids in vinegar also help increase the flexibility of gluten so the dough stretches more easily." 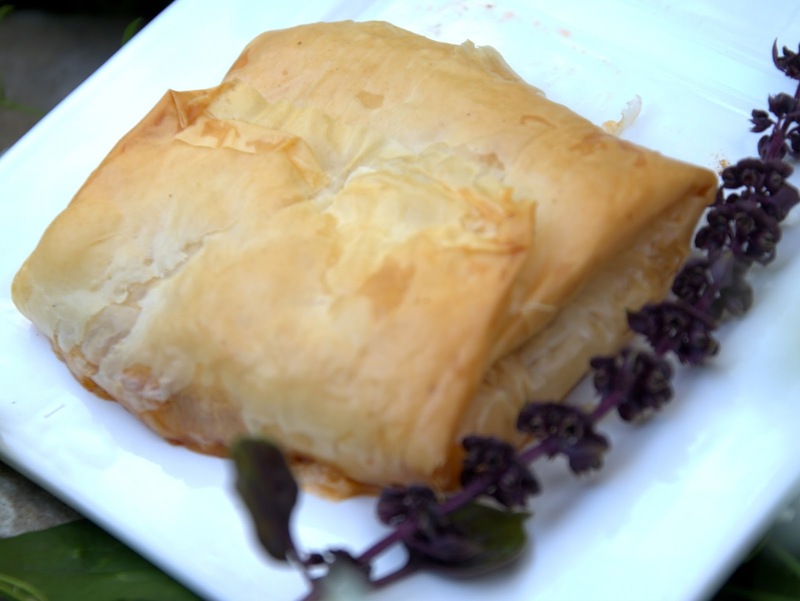 (Anne and Sue) Between the thin layers of developed gluten and pockets of air that are filled from the cooking butter, filo dough creates an experience that is hard to imitate. Besides properly buttering the filo dough layers to give it, the renowned texture people love, I also roasted the heirloom tomato in large slices. Roasting tomatoes alter and concentrate the flavors. The roasted tomatoes also gives the pastry an interesting juicy texture in comparison to the flaky crust. It was important to me to keep this recipe simple and inexpensive based on the concept of creating a pastry around whatever was in abundance in my garden. With simple yet beloved ingredients like tomato, basil, garlic, and filo dough, I would confidently serve this pastry to the pickiest of dinner guests. Roast slices of tomato in a 350 F oven for 35 minutes on a rack with a wire rack. Layer filo dough by brushing with butter before each layer, until there are four layers. 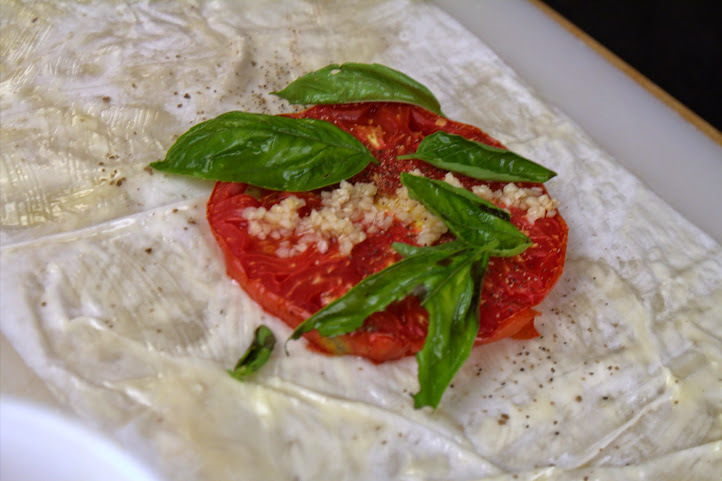 Place one roasted tomato slice, several fresh basil leaves, 2 t of minced garlic, and a pinch of salt and pepper in the middle of the filo dough. Wrap sides around the filling. Pop the pastry back into the oven and bake until golden brown. "What is filo dough and how can I make it?"." The Science of Cooking. Exploritorium.edu, n.d. Web. 10 Sept. 2014. <http://www.exploratorium.edu/cooking/icooks/04-14-03.html>.